February 8, 2019 - A suspect wanted and charged in the fatal shooting of one man and the wounding of another at 8500 Nairn Street about 10:20 p.m. on January 24, 2018 is now in custody. The suspect, Christopher Joseph Cruz (H/m, 21), is charged with murder and aggravated assault-serious bodily injury in the 228th State District Court. 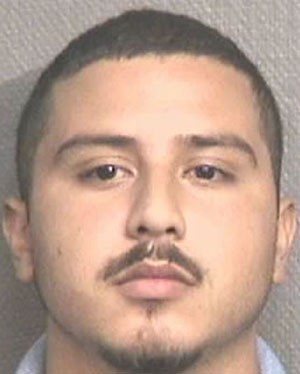 A Harris County Sheriff's Office booking photo of Cruz is attached to this news release. The deceased victim is Raymond Lindgren, 40, of the above address. A second victim, Luis Santos-Rosa, 25, also of the above address, was transported to an area hospital and survived his wounds. HPD patrol officers responded to the 8600 block of Nairn regarding a male found shot inside a white SUV. Officers were told by the wounded man, Mr. Santos-Rosa, that his neighbor, Mr. Lindgren, had also been shot near their apartment complex at the above address. Additional officers went to the Rockport Apartments and found Lindgren deceased in a parking lot on the south side of the complex. A preliminary investigation determined Lindgren and a male suspect possibly got into an argument. The suspect then shot Lindgren, who was then pronounced deceased by responding HFD paramedics. Santos-Rosa witnessed the shooting and, as he tried to drive away, the suspect fired into his vehicle, striking him at least once. The suspect then fled the scene. Further investigation identified Cruz as the suspect in this case and, on September 7, 2018, charges were filed against him. Investigators later determined Cruz had fled to Honduras. He was located and arrested by the Honduran National Police. As of January 31, he was brought back to the United States by the United States Marshals and was booked into the Harris County Jail.